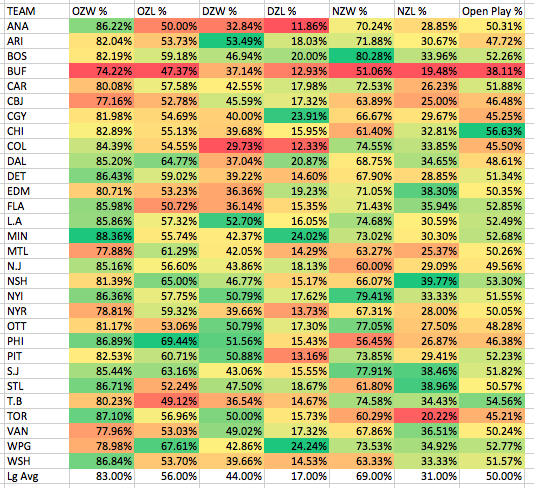 Last week I had reviewed previous work on open-play corsi and looking at the league averages within specific faceoff situations. 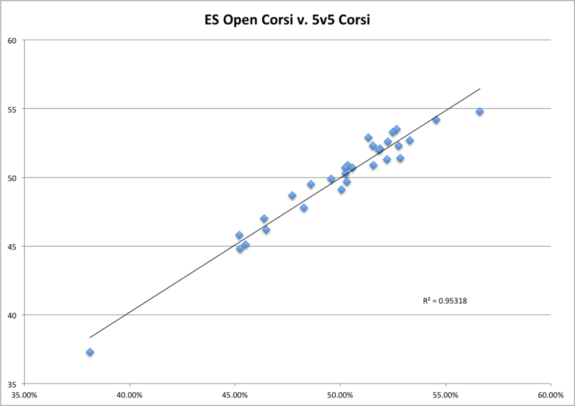 The idea with open-play corsi is that winning or loosing a faceoff is going to give your team a temporary (positive or negative) corsi boost. This could, in theory, lead to more goals, and by maximizing your team’s systems in these areas could potentially lead to more points in the standings. Again, data is available if you wish to play with it. Those who are interested in their current teams play can compare how they are doing to the league, and the league average. I am beginning to question myself if open-play corsi really matters? Is this providing any value or anything new? We know that faceoffs don’t really matter in the NHL as their effect is quite small on winning and losing. This is evident in the amount of time a faceoff effect lasts for. Even more so is that the correlation between Even-Strength Open-Play Corsi vs. 5v5 raw Corsi is r^2 = 0.95. HockeyGraphs have shown that 5v5 raw Corsi is better predictor of play than Corsi close and falls behind Score-Adjusted Corsi. We don’t see to be deriving anything new at the team level from this. Further work needs to look at how many goals winning and losing faceoffs is causing in these situations to see if it is causing loss of points in the standings? My initial guess is that the effect is minimal. Obviously this data is currently only based on a small sample of games in a single season, so the full current season as well as previous seasons should be analyzed to see if this trend continues. 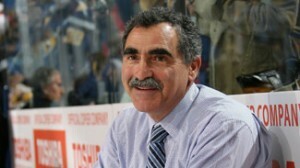 If anything this idea of open-play corsi is interesting, at least to myself. Additional further work would be looking at the open-play corsi values of individuals, forward lines and defensive pairings. If open-play corsi is meant to remove the effect of faceoffs, would open-play corsi remove the effects of Zone Start % on players?